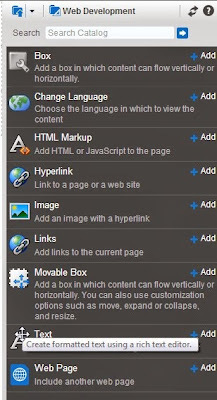 The latest release of Webcenter PS7 has a new and very useful tool called Portal Builder. Portal builder is now a single tool to edit everything in the portal and not only a single page as it was composer in earlier versions to edit a single page. In this post we will be looking at this new Portal Builder tool in WC PS7 and will be using Drag N Drop feature of portal builder which is new in this release. I logged into WC PS7 and created a test portal named TestPortal. This portal has one page. This is Home Page. Now we need to edit this Home Page to add some functionality. We use to do this with Composer tool in the earlier release. 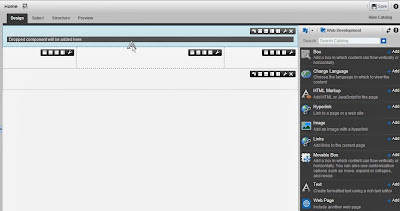 Composer was used to edit a particular page and add functionality or taskflows to it. But with PS7 , Portal Builder is used to edit the complete portal. So whenever we need to edit a page or portal, we will use Portal Builder. Click on settings button on the page (left of user name) and select Edit Page. Portal Builder will get opened. Below is the glimpse of Portal Builder. The left pane which is there , consist of pages which are currently inside the Portal. This consist of all the pages which are part of the portal irrespective of whether they are hidden or visible. 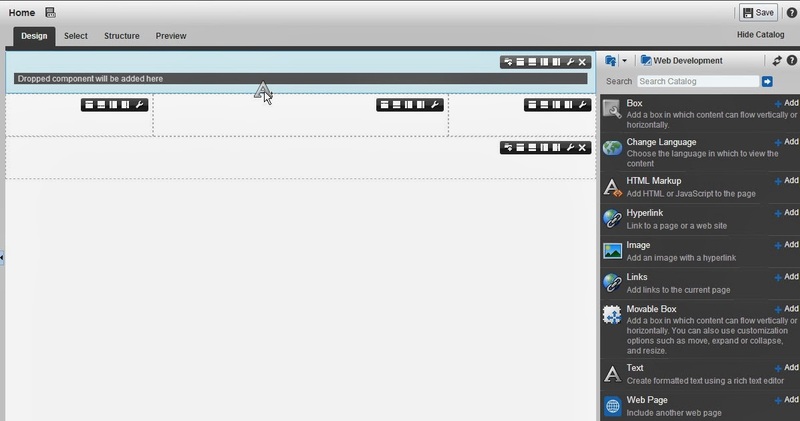 The top bar consist of options like 'Pages' , 'Assets', 'Members' and documents. I will be covering these top bar in my next post, but for now they all are required and can be modified to implement new features , users and documents in the portal. The Right pane is Catalog. This is same as what we use to get in Composer in earlier versions. This has predefined task flows and other features which can be added to the page. The Middle area is what the actual page looks like. Ok so lets see the power of portal builder. Now lets add a simple text on the home page. We will be selecting Home Page on the left pane.Here by default it is selected. Now drill down to Web Development in the Catalog on right pane. Bring the pointer on the text. Pointer will convert into something shown below. This meanse that we can Drag this component. 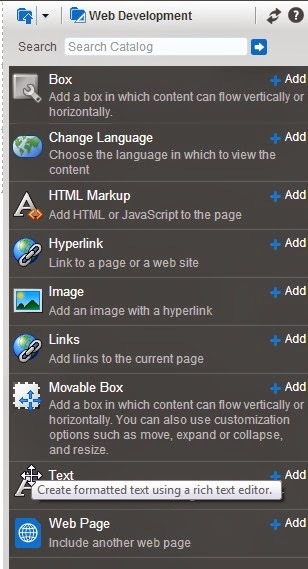 No click and drag this component on any of the box in the page. Now save the changes by clicking save. Now click View Portal link and look at the edited page. Thats it. Webcenter PS7 provides powerful tool Portal Builder which is used to edit Portal. It provides power feature like Drag N Drop . All views expressed on this Blog are my own and do not necessarily reflect the views of my employer or Oracle Corp.